Say hello to Flash Gordon; the world's first flash-powered supercomputer will come online in the San Diego Supercomputer Centre in January. It's being built by Appro International using Intel 710 flash drives and cost a bargain basement (this is supercomputing budget land) $20 million for 280+ teraflops, 36 million IOPS, and 48th place in the top 50 supercomputer list. 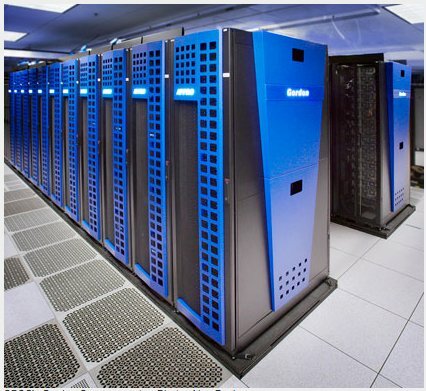 SDSC thinks the 36 million IOPS number makes it the fastest supercomputer in the world in terms of I/O operations. It's not all flash; there is 4PB of disk storage beside the 300TB of flash, a 13:1 ratio in favour of disk, and suggestive of what is a very large flash cache design. It's the flash that led the boffins to christen it Flash Gordon. One thousand and twenty four 300GB Intel 710 SSDs are used and they hook up to the Intel Xeon E5 processors and 64TB of DRAM across InfiniBand. We're told Gordon will have the ability to hold 100,000 entire human genomes in its flash memory system. It may well be the biggest and fastest data warehouse in the world for scientific data and be an unparalleled performer at data-intensive supercomputing tasks. Gordon will "serve UC San Diego and UC researchers as well as be available for use by industry and government agencies, it will also serve as a national computing resource as part of the NSF’s new XSEDE (Extreme Science and Engineering Discovery Environment) program, a nationwide partnership comprising 16 supercomputers and high-end visualisation and data analysis resources."